Captain Alun Wyn Jones did not hide his frustration after the Ospreys slumped to their second successive RaboDirect Pro12 defeat of the new season. 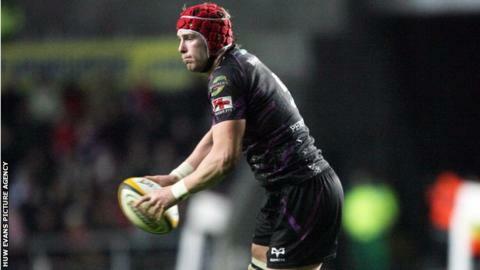 The Ospreys surrendered a 10-point lead to lose 16-13 to Ulster at the Liberty Stadium on Saturday night. That home defeat by the reigning Pro12 champions followed their loss at Treviso on the opening weekend. "We are disappointed and we sound like a broken record at the moment," said skipper and lock Jones. "It's not good enough and we have to put it right." The Ospreys, who were crowned Pro12 champions after a dramatic Grand Final victory over Leinster in Dublin last season, find themselves at the wrong end of the table. Steve Tandy's side lost to Treviso in Italy on the opening weekend of the Pro12 and suffered their first defeat to an Italian side. The Welsh side, the most successful in the competition, are one of three teams - Glasgow and new Italian franchise Zebre - without a victory so far. The Ospreys, for the second time in a week, did enough to beat last season's Heineken Cup finalists, Ulster, but lacked the composure to secure the win. Wales and Lions lock Jones has issued a blunt warning to his team-mates about any possible hangover at being crowned champions last season. The 26-year-old, who has won 66 Wales caps, demands his side forget about former glories and focus on a new season and the defence of their Pro12 title. "We are not going to look at what we achieved last year," said Jones. "It's a new season, we are not the finished article and we were not that when we won the Pro12 last year. We are conscious we are not that either this year. "We have lost our first two [games] and we have to realise that and there wasn't much said in the changing room afterwards. "We will say it in the week and make sure it lingers during the week. We had a 10-point lead and we have to improve and there is plenty to work on." The Ospreys play the Glasgow Warriors at the Liberty Stadium on Friday.